You can DOWNLOAD a brochure about the glacial history of Mendon Ponds. This distinct park offers six Lodges and seven Shelters, all available for rental. 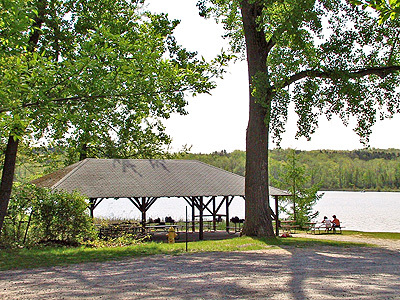 Mendon Ponds has many recreational areas; Sharon’s Sensory Garden, Wild Wings, Inc., a Youth Camping area, and a car-top boat launch (non-motorized boats only). The Mendon Ponds park office is located at 95 Douglas Road, Honeoye Falls, NY 14472. Mendon Ponds Park, which is approximately 10 miles southeast of Rochester, is located south of the New York State Thruway I-90 in the Towns of Pittsford and Mendon. It is bordered by Clover Street on the west and Pittsford-Mendon Center Road on the east. 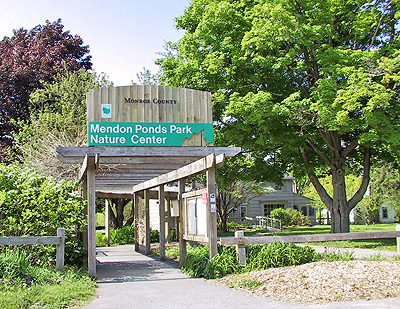 Mendon Ponds Park is open daily and has a Carry-in Carry-out rule, which means you must take all your garbage with you for disposal after leaving the park. 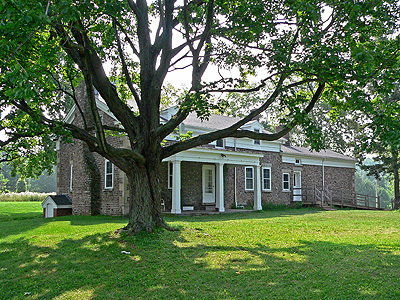 Mendon Park has six lodges and seven open air shelters. The six enclosed lodges come with picnic tables, 4-burner stove tops, a wood burning stove, a grill and water/bathrooms outside nearby. The Cobblestone House has a refrigerator and an oven plus indoor bathrooms, and the Stewart Lodge has a refrigerator. The open-air shelters have picnic tables, grills, and bathrooms nearby. Mendon Ponds Park's unique complex of glacial features helped to make it a National Natural Historic Landmark in 1969. There is a 550 acre nature preserve, and 30 miles of self guided trails full of wildlife. The native preserve is home to a population of chickadees that you can hand-feed. Before heading out to Mendon Ponds Park print the map. The color coded hiking trails and additional details will keep you on the right track. There is a car-top/non-motorized boat launch located off Douglas Rd., which can be used for all non-motorized boats. Fishing is allowed in Mendon Ponds Park as long as those fishing are following NYS Department of Environmental Conservation guidelines and rules and have the required licenses. Mendon Ponds Park has one Rugby field that is available for rent. Click here to request a field reservation online or call 585 753-PARK (7275) for more information. 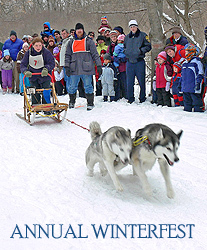 There are two designated sledding hills located across from the Cavalry House Lodge on Douglas Road, and located next to the East and West Lodges on Canfield Road. Many trails are groomed throughout the winter, which accommodate the more than 20 miles of marked cross country skiing trails. Snowshoers should avoid walking on groomed cross-country ski trails. 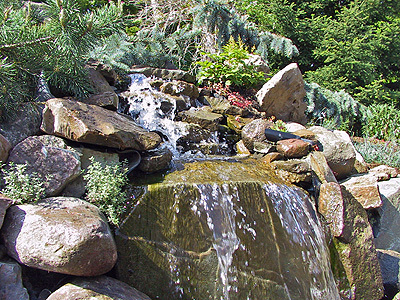 Throughout the United States, sensory gardens are being created to provide persons with disabilities a more suitable opportunity to enjoy nature and the outdoors. Sharon’s Sensory Garden is a unique sensory garden for people with visual or physical disabilities. The sensory garden has over 170 feet of plant exposure designed for visitors to touch, tear, and smell the plant life. Sharon’s Sensory Garden has a diverse selection of plants, highlighting color, texture, fragrances, and form. Flowerbeds are raised and pathways through the garden are properly graded for visitors in wheelchairs. Plant listings and labels are in Braille and raised lettering to help educate visitors. Sharon’s Sensory Garden is a wonderful addition to Mendon Ponds Park for everyone to enjoy. The experience of visiting the sensory garden will enhance your enjoyment of nature as well as your awareness of people with disabilities.